We’re almost halfway through this yearlong project! Wow… we’re almost halfway through. That’s a lot of cocktails. Some good, some great, some utter abominations unto the Lord himself. Yesterday was my birthday. And you know it’s a good birthday when you receive four different bottles of booze! As I mentioned in yesterday‘s post, my brother Paul brought me some White Dog, straight from the east coast. During my birthday party yesterday, my brother-in-law decided to take a similar plunge into pure awesomeness. I received a bottle of St. Germain (which I’ve been dying to get my hands on for about two years now), a bottle of The Kraken Spiced Rum (Release seven more Kraken! 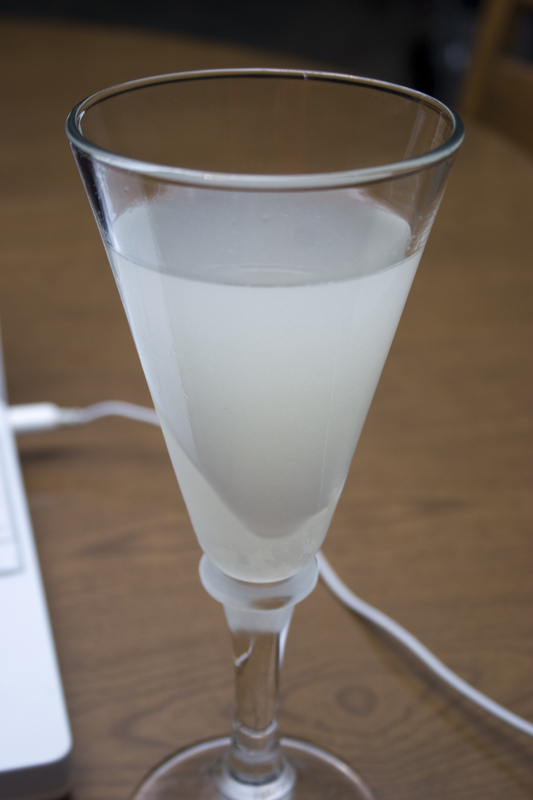 ), and a bottle of Lillet — which is surprisingly hard to track down here in Dodge. So! I have an even wider swath of drinks to cut through now! Huzzah! However, since I’ve been itching to get my hands on some St. Germain for quite a while now, I figured I’d make something little bit sweet, a little bit sour, a little bit French. And something that would be easy. The Gimlet has become one of Jenn and I’s go-to drinks in a pinch. It’s simple, tasty and the ingredients are easy to track down. Let’s see how St. Germain takes on this classic cocktail. The first one up calls for fresh-squeezed lime juice, as opposed to Rose’s Lime Juice. I’m way big on fresh ingredients, as I keep harping to you guys, so I figured I would go with what St. Germain calls for as standard. It’s very smooth, with a distinct floral taste that goes well with the juniper in the gin. Not much sweetness here and the flavors are really left to play around. There is a kicker of an aftertaste, so it may not be for the faint of heart. After the first one I made was just a bit too intense for Jenn, we decided to try the French Gimlet with our usual item — Rose’s Lime Juice. Now, in recent years there have been more people knocking the use of Rose’s Lime in cocktails. It’s certainly not fresh, and it derives it’s sweetness from High Fructose Corn Syrup. But, this is a rare occasion I’m going to say that there’s a reason to use this as opposed to fresh lime juice: It’s tart, it’s sweet and it adds a unique flavor to the cocktail. It may be synthetic, but there’s still a reason it’s a popular bar item. Am I saying you should use this in EVERYTHING? No way. Use fresh lime juice whenever possible. But there are times when you may need to adjust for personal taste. Rose’s does a great job keeping that same tartness, but taking off a bit of the bite. Me: I personally enjoyed the French Gimlet No. 1, with the fresh lime juice. I felt that the St. Germain gave enough sweetness to the cocktail that I didn’t need that extra boost from the Rose’s. I think part of the burn could be mitigated by using a higher quality gin. I used Tanqueray. I’m thinking something like Hendrick’s, which has a smoother aftertaste. I’d probably avoid something like New Amsterdam, as I think that would simply make the drink much too sweet. Jenn: She preferred the second version with the extra help from Rose’s. After tasting the first, she kind of nodded and looked thoughtful. She said she felt there was a bit of an afterburn on the drink. We added the Rose’s, which she said rounded out the flavor.